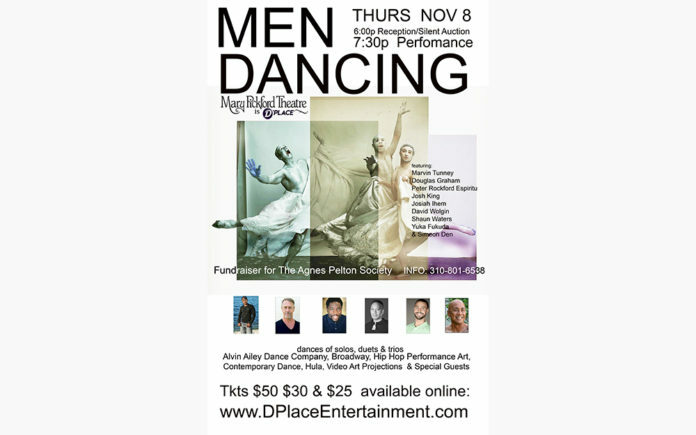 Men Dancing is a dance concert of solos and duets by professional male dancers formerly with the Alvin Ailey Dance Company, original shows from the Broadway productions, and Hip Hop Performance Art backgrounds. The featured artists include Marvin Tunney (Ailey Co.), Douglas Graham (Bob Fosse dancer), Peter Espiritu (Tau Dance Theater), Joshua King (Ailey School) , Josiah Ihem (CSUB), Simeon Den and guest performer, Yuka Fukuda (Alvin Ailey Repertory Dance Co.). The multi-media production includes live music, original choreography, and video art projected on the full, wide-screen of the commercial movie theater. Simeon Den, producer and featured dancer of Men Dancing was trained at the Alvin Ailey American Dance Center (NYC) in ballet and the Martha Graham and Lester Horton modern dance techniques. He performed internationally in prominent modern dance companies and on Broadway in the original Stephen Sondheim musical, “Pacific Overtures,” and the “King & I” with Yul Brynner. He has worked with entertainment luminaries including Lena Horne, Shirley MacLaine and choreographers Jerome Robbins, Gower Champion, and Michael Kidd. He co-directed the Den/Takazawa Dance Group and school in Hawaii for two decades before moving to Los Angeles and reinventing himself as a fine art photographer. Den is the owner of Simeon Den Gallery/Fine & Temple Arts in Cathedral City, where he produces provocative and diverse art exhibits by off-the-main-path visual artists, hosts symposia on New Art and artists, avant garde dance performances, and teaches yoga and meditation. There will be a pre-show reception and silent auction of fine art photography held at 6-7:30 in the mezzanine of the Mary Pickford Theater in Cathedral City. The performance begins at 7:30pm. Tickets are available online a www.DPlaceEntertainment.com Information at 760-459-3564. Men Dancing is a fundraiser for the arts advocacy, Agnes Pelton Society, a 501c3 arts and arts education non-profit, whose mission is to support the legacy of the American Modernist painter and former Cathedral City resident, Agnes Lawrence Pelton, by supporting local artists, providing free arts education opportunities for children and annually gifting scholarships to graduating Cathedral City High School art students.